For years, the Japanese and Europeans have enjoyed a range of cars smaller than the standard American "subcompacts." Toyota's popular series are now finally being modified and shipped to the United States, and the first fruits are the Scion xA, xB, and tC. These vehicles, devoid of American Toyotas' bland styling, are regular size for Japan, and small for the United States. The low end of the Scion range is the xA, a traditional hatchback with more than a passing resemblance to the Mini. Powered by a gutsy little 1.5 liter engine, the xA is unusual in many ways, including where Toyota does and does not cut corners. Gas mileage is 32 city, 38 highway with either the automatic or the five-speed stick, nothing to sneeze at, though not better than the considerably larger, more powerful, and similarly priced Toyota Corolla. But the xA and Corolla share little in common, other than their parent: where the Corolla coats everything in velvet and isolates you from any mechanical feel, the xA shares the road, engine, and gears with you for a more tactile, non-appliancey feel. The xA uses its small footprint well, but you can't get around the fact that it does have a very small footprint. While terribly convenient for parking and storage - you can use half of your garage for bicycles, lawnmowers, and toys, and still park in the other half (depending on the size of your garage), the size also means that there's not much space for cargo. It's tall, so headroom is quite good, and the cargo bay is very conveniently sized, but legroom is tight, and the cargo bay is small. 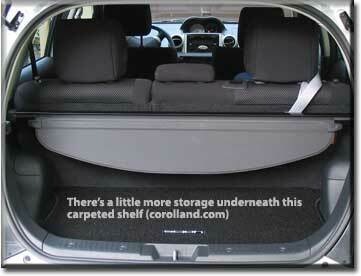 The rear seats do fold down so you can carry a good amount of stuff, albeit with no more than two people. Larger people - particularly wider people - may find the seats uncomfortable, and the side of the car too close at hand. While some like the feel of a small car, others may find the xA to be a bit too small. Legroom isn't bad for either the front or rear passenger - but for both to have legroom at once may be tough. On the lighter side, the fornt seats are set relatively high off the floor, so there is room for feet underneath. Despite the small size, the Scion xA is apparently pretty safe - garnering 4 out of 5 star ratings in every government crash test. Side airbags are optional, and antilock brakes - electronically balanced over four wheels - are standard. The interior is inexpensive, but not cheap. The dashboard is a mass of textured black plastic, but the seats look good, with a sturdy fabric, side bolsters, and adjustable headrests; the keyway unfortunately looks fairly cheap and doesn't have a dust guard. The door panels are designed to look like leather (they're plastic). The trim is chrome colored plastic, emulating brushed aluminum, for a modern silver and black look that carries over to the gauges. Four prominent round vents carry air quietly into the cabin, even with the fan at top speed. These vents are easy to redirect, and don't "leak" air in other directions - but they can't be closed individually. The xA, like the Echo before it, features a centrally located instrument panel on top of the dashboard, which is handy for Toyota (since they don't need to have two versions, one for left-drivers and one for right-drivers), but a bit less handy for owners. The gauges are fairly small but clear, with the speedometer being black on white and the tachometer being white on black; the fuel gauge is on the bottom half of the speedometer, and that's it for gauges. You know when the engine is cold from a blue light, and when it's hot from a red one. Oil pressure and voltage are indicated through warning lights if there's a problem. The backlighting is well done, perfectly smooth and a with a slight amber tint to preserve night vision and highten visiiblity in all types of light. The exception to that is the stereo, which has its own user-adjustable backlighting (at least in our test car). You can even set it to cycle through its various colors. The stereo looks like an aftermarket unit, and, indeed, it has both the names Scion and Pioneer on it. 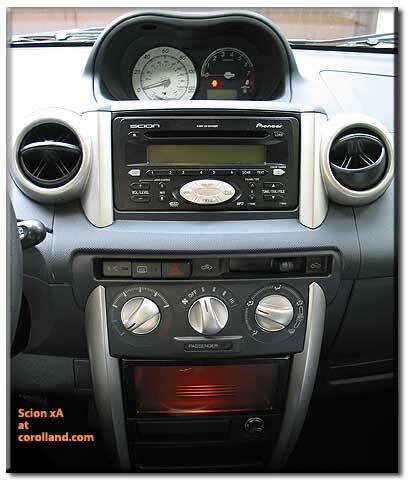 There are no functions that require the Scion stereo head unit to be there, so you can easily swap it out. Sound is better than one would expect, another example of Toyota being selective about where to spend money. (Another example, by the way, is actually putting a real lock on the passenger door, which seems to be going out of fashion; and having foldaway outside mirrors). The stereo is up in the high center part of the dashboard, where it's easy to see and use. Unfortunately, its user interface is not especially well designed; everything must be done with buttons, and the layout isn't especially intuitive. The power button is just to the right of the center of the unit, not where most people would look for it - and the lettering of the mode choice / power button is silver on silver. Beneath it are option buttons (a/c, rear defroster, hazard flashers) and the recirculation vent; beneath that are the three large knobs of the climate control, for temperature, fan speed, and vent selection. The large knobs make it easy to adjust even with gloves on. Underneath the climate control is a rather nice covered compartment, unusual because the inside is always lit, and the cover is brown-tinted rather than solid, for a rather nice effect. There's also an ashtray and extra bin in the center stack, which makes up for the lack of a center covered console. In between the seats is the gearshift, a pair of primitive cupholders, and a couple of uncovered storage bays that complement the map pockets on both front doors, the under-glove-compartment minibins, and the glove compartment itself - which won't hold much more than the usual documentation. It's good that Toyota is selling the Scions as a separate line, because the feel really is different from the Corolla, Camry, and, especially, the Avalon, and it's never good to confuse American customers. The ride and handling are very different from the Corolla, providing much more road feel and a busier, firmer ride, with considerably better handling and a nimble feel. It's not the sportiest car, but it does take to being pushed around sharp turns nicely, and the small size works to its advantage. There is some body roll, but not too much, and some torque steer as well, which might be reduced by using better tires. We were pleasantly surprised by the absence of sound effects around sharp turns. The suspension is firm but not unforgiving, able to deal well with road imperfections without losing traction or shocking the driver. The Scion xA feels and sounds solid, more so, in some ways, than the prior-generation Corolla. While small, it doesn't feel light or "tinny." It takes well to being thrown around. The light weight means that the little engine doesn't have to work too hard to get quick acceleration. It likes to be revved high; while noisy on acceleration (what most reviewers call "unrefined" on American cars), many like to hear their engine, and it's not intrusive in normal driving. The note changes when you near redline, so you can drive by ear rather than by eye, using the tachometer just to get used to the engine's warning sounds. The five-speed stickshift- the best way to order a Scion, since it maximizes power - is easy to use, with a smooth clutch that makes it easy to switch from an automatic. You won't miss it, even in stop and go traffic; the Scion makes it easy to manipulate both clutch and stick. Gear ratios are set up to make sprints go by quickly, but the engine is revving pretty high at highway speeds - over 3,000 rpm at 65 mph; that means you have good power on the highway but the engine's a bit noisy. The Scion is more a city car than an Avalon-style highway cruiser, though it can deal with 65 nicely and feels stable. 0-60 goes by in under ten seconds with the stick, and under eleven with the four-speed automatic. The EPA claims you don't lose any gas mileage with the auto, but the car doesn't feel as quick or fun with it. Sprints aren't too much slower, but in ordinary driving, the stick provides considerably more pep. To its credit, the automatic downshifts rapidly to provide power, and feels good on the street. It only seems to hurt at highway speeds over 60, or when you want sudden get-up-and-go - and then it lets the engine race for a moment before collecting itself, downshifting, and grabbing. With 108 horsepower and 105 lb-ft of torque, the little engine is well balanced. Air conditioning is more than powerful enough for the car, but doesn't seem to tax the engine much - or change its power output. As an essentially Japanese car also selling well in the European market, the Scion xA comes with foreign-style fender-mounted turn signals - not the ones that ride on top of the fenders (which older people are more likely to remember), but the ones on the sides, a la Saab. These provide a clear warning of your intentions, if you are one of those who actually uses turn signals correctly - as a warning rather than to show a fait accompli. The headlights are unusually bright and well-focused. Visibility is very good, with the usual minor exception of the rear quarter where the rear seat's headrest can get in the way, along with the rear pillar (which does have a window cut into it). 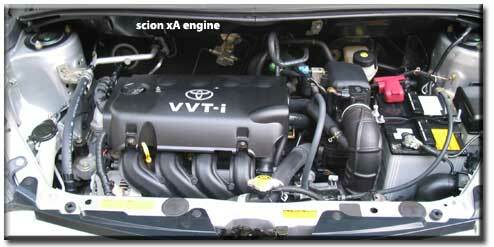 The Scion xA is not cheap, at $12,900, but it is a rather enjoyable and economical car. Standard features include four-wheel electronic ABS, a first aid kit, intermittent wipers, rear window wiper, 160 watt Pioneer stereo with six speakers, air conditioning, tilt steering, tachometer, power locks and windows, and rear defogger. Our test car rang in at $14,938, thanks to some good and some overpriced options - a six-disc CD changer ($395), rear spoiler ($385), fog lights ($58), alloy wheels ($665), and carpeted floor and cargo mats ($120). The price of the car is much more reasonable than the price of the options. The warranty is standard for the times, 3 year - 36,000 miles for bumper to bumper, 5 year - 50,000 miles for the powertrain, and five years for rust-through. We liked the Scion xA - we really did, though we'd have liked it even more with cruise control. One gets used to the center-mounted gauges, aftermarket-looking stereo, and size pretty quickly. The xA is not for everyone, though - it's small, no doubt about it, and some people find it cramped and say it feels unsafe even though Federal crash tests say it isn't. Sometimes, the small size a real plus; sometimes, you'd like just a little more space. But they do pack a lot of good stuff into that little package. 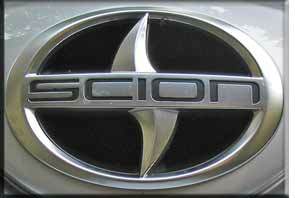 This page has been moved to a new Scion specifications page.